Sanskrit' (संस्कृता वाक् saṃskṛtā vāk, for short संस्कृतम् saṃskṛtam) is a classical language of India, and a liturgical language of Hinduism, Buddhism, Jainism & Sikhism. Classical Sanskrit is the standard register as laid out in the grammar of Pāṇini, around the 4th century BCE. Its position in the cultures of South and Southeast Asia is akin to that of Latin and Greek in Europe and it has significantly influenced most modern languages of Nepal and India. The pre-Classical form of Sanskrit is known as Vedic Sanskrit, with the language of the Rigveda being the oldest and most archaic stage preserved, its oldest core dating back to as early as 1500 BCE, qualifying Rigvedic Sanskrit as one of the oldest attestation of any Indo-Iranian language, and one of the earliest attested members of the Indo-European language family. The corpus of Sanskrit literature encompasses a rich tradition of poetry and drama as well as scientific, technical, philosophical and Hindu religious texts. Today, Sanskrit continues to be widely used as a ceremonial language in Hindu religious rituals in the forms of hymns and mantras. Spoken Sanskrit is still in use in a few traditional institutions in India, and there are many attempts at revival. Shakti, from Sanskrit shak - "to be able," meaning sacred force or empowerment, is the primordial cosmic energy and represents the dynamic forces that move through the entire universe. Shakti is the concept, or personification, of divine feminine creative power, sometimes referred to as 'The Great Divine Mother' in Hinduism. On the earthly plane, Shakti most actively manifests through female embodiment and fertility - while also existing in males, in its potential, unmanifest form. Not only is the Shakti responsible for creation, it also the agent of all change. Shakti is cosmic existence as well as liberation, its most significant form being the Kundalini-shakti, a mysterious psychospiritual force. Shakti exists in a state of svātantrya, dependence on no-one, being interdependent with the entire universe. In Shaktism, Shakti is worshiped as the Supreme Being. However, in other Hindu traditions of Shaivism and Vaishnavism, Shakti embodies the active feminine energy Prakriti of Purusha, who is Vishnu in Vaishnavism or Shiva in Shaivism. Vishnu's female counterpart is called Lakshmi, with Parvati being the female half of Shiva. Shiva is usually worshipped in the form of Shiva linga. In images, he is generally represented as immersed in deep meditation or dancing the Tandava upon maya, the demon of ignorance in his manifestation of Nataraja, the lord of the dance. 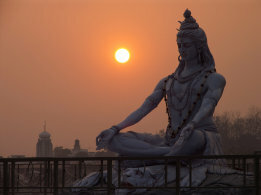 In some other Hindu denominations, Brahma, Vishnu, and Shiva represent the three primary aspects of the divine in Hinduism and are collectively known as the Trimurti. In this school of religious thought, Brahma is the creator, Vishnu is the maintainer or preserver, and Shiva is the destroyer or transformer. It is not a concept that comes from within the religious system itself, although it is generally recognized internally as different from the Vedic tradition. This immediately makes it suspect as an independent category. Rather than a single coherent system, Tantra is an accumulation of practices and ideas which has among its characteristics the use of ritual, the use of the mundane to access the supramundane and the identification of the microcosm with the macrocosm. The Tantric practitioner seeks to use the prana (divine power) that flows through the universe (including one's own body) to attain purposeful goals. These goals may be spiritual, material or both. A practitioner of tantra considers mystical experience or the guidance of a guru imperative. In the process of working with energy, the Tantric has various tools at hand. These include yoga, to actuate processes that will "yoke" the practitioner to the divine. Also important are the use of visualizations of the deity and verbalisation or evocation through mantras, which may be construed as seeing and singing the power into being. Identification and internalisation of the divine is enacted, often through a total identification with a deity, such that the aspirant "becomes" the Ishta-deva or meditational deity. Kundalini (kuṇḍalinī कुण्डलिनी) Sanskrit, literally "coiled". In Indian yoga, a "corporeal energy" - an unconscious, instinctive or libidinal force or Shakti, envisioned either as a goddess or else as a sleeping serpent coiled at the base of the spine, hence a number of English renderings of the term such as 'serpent power'. Kundalini is considered a part of the subtle body along with chakras (energy centres) and nadis (channels). Each chakra is said to contain special characteristics . The overall concept has many points in common with Chinese acupuncture. Yoga and Tantra propose that this energy may be "awakened" by such means as austerities, breath and other physical exercises, visualization and chanting. It may then rise up a subtle channel at the spine (called Sushumna) to the head, bringing psychological illumination. Yogis tend to attempt this alone, Tantrics in couples, both usually under the instruction of a guru. When Kundalini Shakti is conceived as a goddess, then, when it rises to the head, it unites itself with the Supreme Being (Lord Shiva). The aspirant becomes engrossed in deep meditation and infinite bliss.